THE STORY: In 1858, on a plantation in Georgia, a young mother is suddenly sold, leaving behind her husband and their five-year-old son. Through a magical evening of storytelling, music and dance, the enslaved community comes together, not only to comfort father and son, but to heal and strengthen themselves. 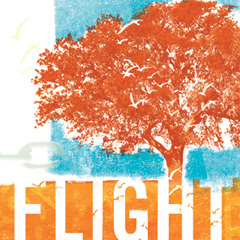 FLIGHT is an inspirational theatrical experience for the whole family. These empowering stories, based on actual slave narratives, as well as African and African-American folktales, celebrate the African-American oral tradition as it passes from generation to generation… to you. "It took me a couple of weeks to get to it due to some recent travels, but I'm so glad I finally saw "Flight." This current Long Beach Playhouse Mainstage production runs through June 16 and should not be missed by anyone whether young or elderly, black or white." “There's no denying its soaring power." props… sets, costumes and huge casts to provide the stories told so exquisitely by this gorgeous collection of griots. Flight is a giant step for Charlayne Woodard who, after three solo autobiographical plays, proves that she can skillfully create a dramatic funny ensemble piece."